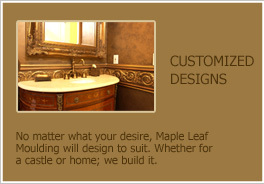 Maple Leaf Moulding is able to match any profile presented. We thrive on the challenge of new ideas, new visions and custom projects. If you can envision it, we can build it. Established in 1980 by dedicated skilled craftsmen. 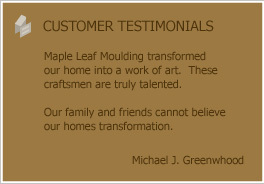 Today Maple Leaf Moulding is a leader in architectural and ornamental mouldings. Maple Leaf Moulding Ltd. is a leading Canadian manufacturer of architectural and ornamental mouldings for residential and commercial properties. Established in 1980 by dedicated skilled craftsmen backed by a long architectural heritage. The dedication continues today through our devotion to craftsmanship and quality. The superb craftmanship and personal attention to the details of an evolving project has played the prominient role in the satisfaction of our customers, and their loyalty to our company. A state of the art fabrication studio, combined with the highest quality products and artistic capacity create for our customers a work of art.